For the first time — The Open Table KC received two previous grants to help start and make progress in the desire to create a multiracial church — there wasn’t a significant amount of questions, or feedback they had to give. Four years later, 25-30 percent of those at Open Table are people of color and the community is growing in spiritual formation, discipleship and social justice. 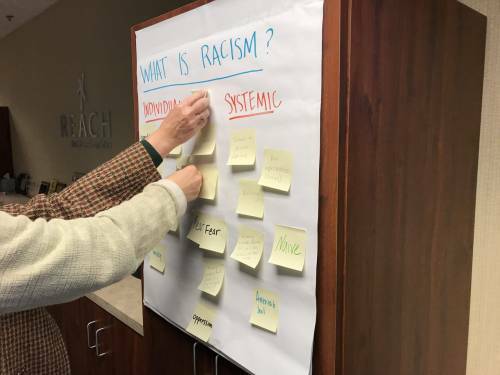 In 2017, the organization used a $50,000 development grant from Leadership Education at Duke Divinity to train 10 people of color and 10 white people — with a variety of religious and racial backgrounds — to lead antiracism trainings for a variety of Kansas City organizations. The Open Table was the only church invited to participate in Kansas City Mayor Sly James’ Race and Equity public conversations and training events in 2018. Pickrell will be one of the panelists at a citywide race conversation event on Jan. 16. After training one of Kansas City’s downtown restaurants, Pickrell received a call from the owner who’d been concerned that white servers were quick to call police if they saw a person of color walking around outside his restaurant. One server had approached him about a person of color with apparent mental health issues talking to himself and pacing up and down the sidewalk. Stories like these leave Pickrell proud, but humbled. Increasingly he recognizes how racism affects everyone. Recently, The Open Table KC received a $30,000 Paragon Grant from the Synod of Mid-America to develop transformational and experiential discipleship curriculum in 2019. “So that we are not unwittingly perpetuating and recreating unjust systems,” says Pickrell. There will be opportunities for direct service work based on Matthew 25. As the discipleship curriculum work begins, The Open Table KC is hosting, coaching and training two 1001 New Worshiping Community residents in 2018-19, thanks to a partnership between PMA and Heartland Presbytery. They’ll be an incubator of sorts for new leaders to plant their own worshiping communities throughout the presbytery. All white when it began, The Open Table KC now has a diverse 15-person leadership team. It includes people of color and LGBTQ+ members, with a wide range of socioeconomic backgrounds. “This leadership team is empowered to lead and drive our culture, ensuring that we create a community that is actually inclusive,” says Pickrell. 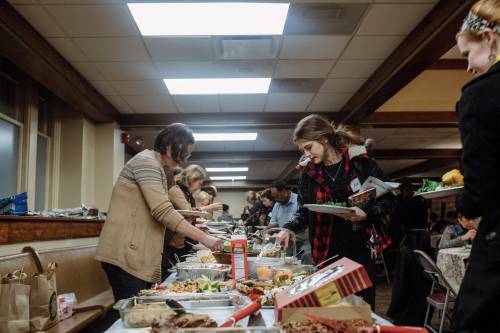 Twice a month, The Open Table KC gathers in the Fellowship Hall at Second Presbyterian Church for dinner and conversation around social issues. At one of their antiracism gatherings 170 people came. “We can’t call ourselves a community of peace and reconciliation in a city divided, without addressing America’s original sin of racism,” says Pickrell. While Pickrell primarily focuses on running Open Table and community organizing, co-leader Wendi Brackhaus works on spiritual development. She is a member of the 2019 1001-Vital Congregations national conference which will be held in Kansas City October 13-17. Watch for registration information coming soon. Mission Program Grants are made available through the Racial Equity & Women’s Intercultural Ministries of the Presbyterian Mission Agency. These grants support new worshiping communities’ and mid councils’ work to transform existing churches. In the October/November Grant cycle, 41 new worshiping communities received grants. In 2012, the 220th General Assembly of the PC(USA) declared a commitment to a churchwide movement that resulted in the creation of 1001 worshiping communities over the next 10 years. At a grassroots level, hundreds of diverse new worshiping communities have already formed across the nation.